Alfredo Poggio lived in the humble, yet beautiful farmhouse which his family had bought in 1919, located amongst the woods of Rovereto, Piedmont, where he was born. His relaxing pastime of making wine eventually became his daughter Franca's lifelong passion. Franca, who was working in Milan, one day decided to leave the hustle and bustle of city life and devote herself completely to her love of wine. With only a couple of hectares to work with, she and Gaspare Buscemi began to produce small quantities of Cortese which was then sold to friends and friends of friends until Franca’s daughter Francesca took over in the late nineties. During this period, demand for Gavi was high and Francesca began to plant a few more hectares, until she was happy that both quality and quantity were in unison. 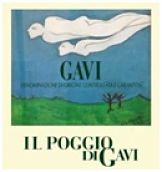 Perched on the highest hill of the Gavi territory, Il Poggio di Gavi is now also run as a charming B&B with a couple of rooms that overlook the spectacular backdrop of woodland and rolling hills. In the autumn of 2018, a brand-new tasting room was built and showcases the cantina on a more personal scale. Here you can witness first hand, the identity and evolution of Il Poggio, which has become, over the years, a premium quality estate with a unique character and personality that would make Alfredo burst his buttons with pride!